Dino-File written by Professor Richard Moody and published by Hamlyns is a handy encyclopaedia which covers a bounty of knowledge of the most famous 120 Mesozoic beasts. The majority are dinosaurs but there are also descriptions of pterosaurs, icthyosaurs, pleiosaurs, turtles and crocodiles. Each animal is introduced by a classificaton from infraorder to scientific name and the meaning of name in English. A simple strip of information that adds to greater understanding both of the individual and its close relatives. Colourful drawings of each dinosaur add to the beauty of this guide with every detail of the body from nostrils to brow-horns, from spiked tail club to scythe like claws. Small silhouettes are employed to draw comparison between the dimensions of each beast to those of a man two metres tall. The illustrations reflect the animal in motion and together with a short, but detailed description of the animal provide a great insight in the history and evolution of the dinosaurs. 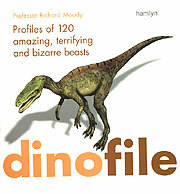 Dinofile is an authentic collection of facts for amateurs and professionals alike and is perfect gift for a DINONERD!